NUT NIBBLERS: Regent parrots and colleagues are dining on the region’s almonds ahead of this year’s harvest. The crop is selling at almost double prices from last year because of global shortages. The almond harvest is at least two weeks off, but some colourful nutters are already in Ian Keens’ biodynamic orchard in Colignan, partaking of an entree before the big feast. 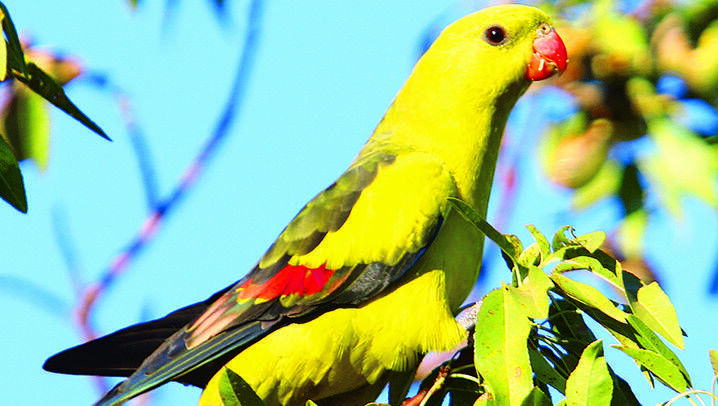 Small flocks of yellow Regent parrots, an endangered species, have moved in to chow down on some of the world’s most expensive almonds. Almond prices have soared to record levels in the past twelve months because of a global shortage. Most of California, the heart of world production, remains in what the American Geophysical Union describes as worst drought in 1200 years, and output is well down. The rainbow alliance of parrot species that haunt Ian Keens’ orchard, regents, galahs, corellas, sulphur-crested cockatoos, Mallee ringnecks, yellow rosellas, are oblivious to the price hike. And it's bad news for those California almond groves.